The environment of the new port area has been dramatically improved. 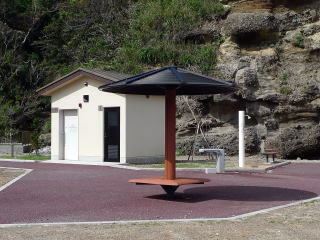 Now there is a nearby new park, which has toilet with bidet functions and water tap at a public water fountain. You may take even shower in summer. The sports fishermen, who were nuisance when I came to the quay, have gone to the new designated fishing place outside of the breakwater. There are only very small shops for provisioning and just a couple of restaurants. The availability of fuel was not confirmed. Mera is a famous good natural port under quiet conditions. But, as it is open to west, it is affected by west wind. When west wind is strong, as waves roll on to the narrow port entrance, it is hard to sail into the port. From the port entrance, Mera Port is southeast to your right; Koura is northeast to your left. Be very cautious when you mooring at the new port area with west wind. 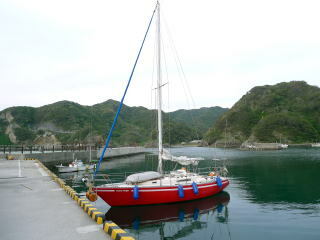 I took hard time with west wind when I moored there for the first time. The weather forecast had said that it would be a strongish wind though, the actual wind was over 10 m/s. The sea got choppy. Splash caused by waves hitting the quay was pouring onto my boat like raining. The boat was rocking hard. It was like being hit by a typhoon. 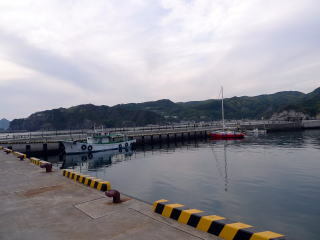 The port is very quiet in the usual cruising season, i.e. from spring to autumn. But, with the seasonal west wind which starts in November, the wind gets stronger at the new port area because it looks located in the middle of the west wind lane. It is shallow at the southeast corner of the new port area. There is a dumped stone. No bitt there. Don’t move your boat close to there. 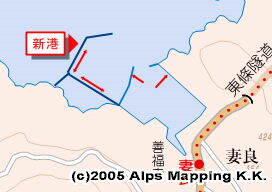 The nearest Onsen is Shimogamo Onsen. Ride an east bound bus for twenty minutes and get off at Tropical Botanical Garden bus stop. Going over a river and walking for five minutes, there is big clean “Gin no Yu” municipal onsen. JPY900. As there is a big supermarket in front of the bus stop, it is convenient to take bathing and provisioning both. Kagiyama Inn has onsen bathhouse services for JPY1,000 until 5pm. Hotel Minaminoso also has onsen for JPY1,500 from 4pm.